If you’re looking for between 1 and 50 custom puppets made to order, Picture to Puppet can help. All of our bespoke puppets are hand made in our Edinburgh studio to your exact specification. We can create custom puppets from a picture, photo or description. Our puppets can be made from cartoon characters or likenesses of real people. We run a highly personal bespoke service, and will chat with you in detail about exactly what your requirements are and how your ideas can best be brought to life. The price of your custom puppet will vary according to the complexity of your design, but guideline prices are detailed below. Get in touch with mari@picturetopuppet.co.uk for an exact quote. Ask about reduced prices for multiples of the same design. 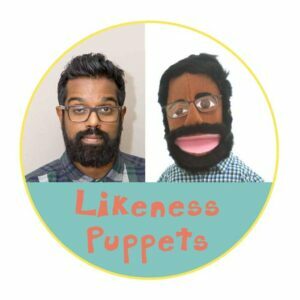 Transform a photo of someone into a lookalike puppet! are a maximum of 45cm tall. Simply email your image or description to mari@picturetopuppet.co.uk or come to visit us at 64 Constitution Street! Or you can give me a call on 07403708680. Contact me to order bespoke puppets.